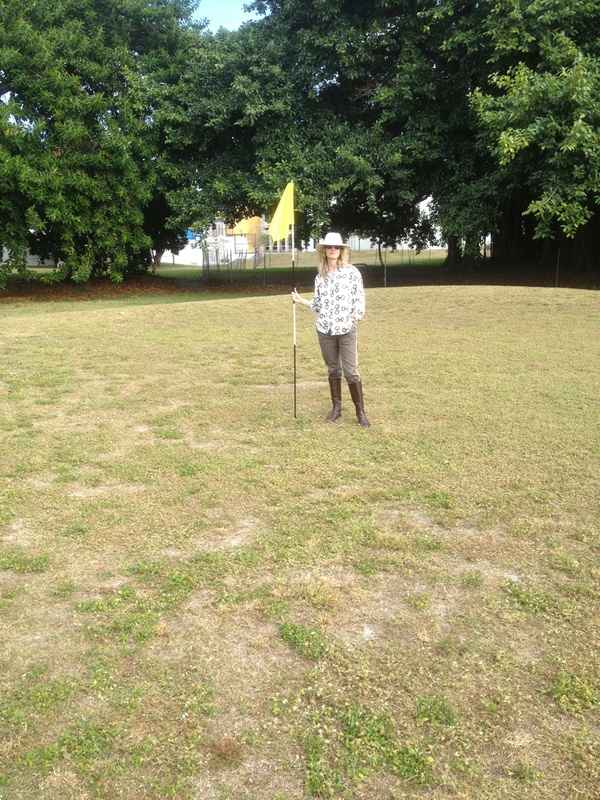 Bill & Lisa's Sporting Life: BAYSHORE MUNICIPAL GOLF COURSE- THE PRICE IS RIGHT! BAYSHORE MUNICIPAL GOLF COURSE- THE PRICE IS RIGHT! Since their marriage in 2001, my daughter Hadley and son-in-law Yannick have resided in Miami Beach's South Beach in the Bayshore area not far from the posh Miami Beach Golf Club and the bustle of 41st Street. When I first visited Hadley at her home, we would walk her Doberman "Atlas" to a nearby parkland area featuring immense banyan trees where he frolicked with other dogs. But this was no ordinary park! It was the home of the Bayshore Municipal Golf Course- a sporty 9 hole par 3. It was not well kept in 2001. I would charitably describe the condition of the greens at that time as shaggy, and weeds prevailed in the bunkers. 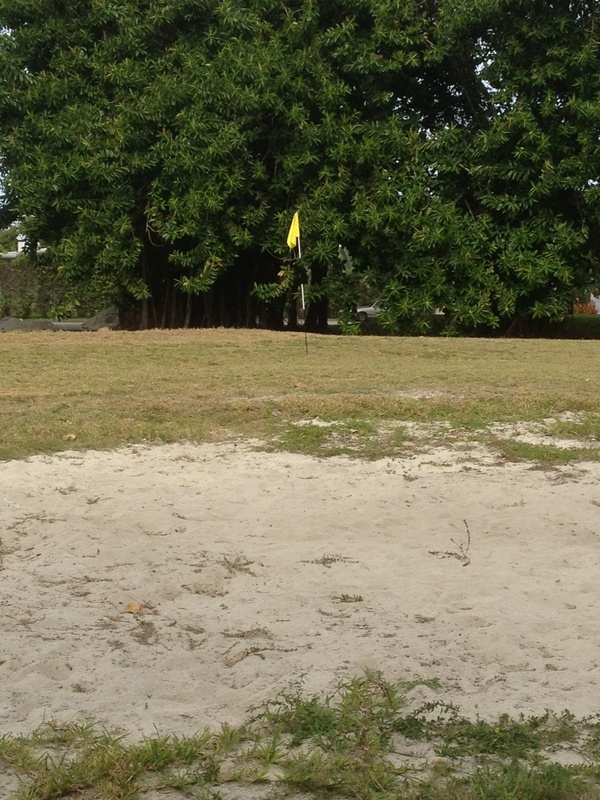 The City of Miami Beach exhibited little interest in maximizing the revenue from the par 3. Rarely would a city employee man the humble hut at the Prairie Avenue entrance to collect greens fees. Despite the shortcomings of the layout, I enjoyed sneaking in some quick practice when walking the dog, and I can recall paying to play only once. On my periodic visits to Miami Beach , I would always look forward to checking out Bayshore Muni. However, every year the course deteriorated further. The greens became completely unputtable, and I would have to hole out using my wedge. Worse yet, development nibbled around the edges of the golf course. 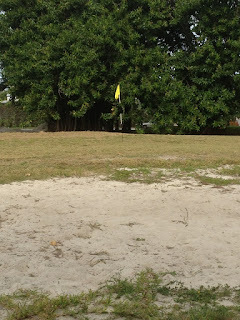 Expanded facilities of an adjacent youth center and school resulted in the loss of two of the holes on the course's periphery around 2005. Collection of greens fees ceased altogether. My understanding is that the only reason the derelict course still existed is that a condition of the grant of the land to the City is that it must be used as a golf course. Otherwise, title would revert to the descendants of the grantor. When visiting this Christmas season, Lisa and I grabbed a couple of clubs and took the traditional dog walk up Royal Palm Avenue from Hadley's house to the old par 3 muni. This time, however, it was our corgi pup "Angus" who accompanied us (Hadley's wonderful canine Atlas has gone on to doggy heaven). I was sad to discover that a third hole of the original nine (and my favorite on the course) had been lost to the youth center. Lisa and I batted a couple balls around the remaining 6 holes while Angus cavorted in the bunkers and banyans. Lisa had some misgivings regarding the value of chipping and pitching on holes so poorly maintained. But after a round the next day on a full 18 hole course, she acknowledged that her short game practice at Bayshore helped. For me, trying to hole the ball with a wedge on unkempt greens harkens me back to my youth when I wedge-putted to a hole I had planted in our backyard. I played to that hole from 9 different tees from various distances from all over the neighborhood. This helped me acquire versatility with my wedge which unfortunately time has taken away. So Bayshore is still golf, and its still fun. (And for now at least, its free!) When I stood on the 180 yard first hole and eyed the green, I was still excited about the challenge of trying to hit a green well guarded by a yawning (though unmaintained) bunker. So golf continues on in a fashion at Bayshore among the dogs and kite-fliers. Golf has been played there since 1940. Well known player and architect Bruce Devlin has his name on the redesign of the course which occurred several decades ago. The city has considered various plans for fixing the place up, but the multi-million dollar price tag has so far discouraged such efforts. I don't know what the future holds for this little course, but I was heartened to see several city workers tidying up a couple of the bunkers later on in our stay.